Crossing several generations of technology is often a challenge, when one tries to connect an antique telephone to a modern telephone line. Usually the electrical properties and specs are similar enough, to make it work. But it is the actual physical connection that is often the hard part. For me that is, as I try to keep things original. The original material is often missing. 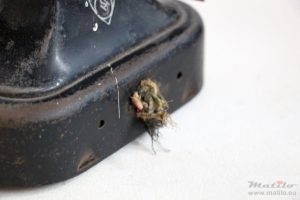 The plug is gone, the wires frayed, terminal box damaged, cord cut or damaged: an antique phone is only in a very few instances just plug and play. And of course, the older the phone is, the harder the problem is. Yes, I know: basically it is a matter of connecting 2 wires. How hard can it be? Well I like to do things properly and old style. I like my phones to look like they did when they were made, back in the day. To look like when they were in daily use. 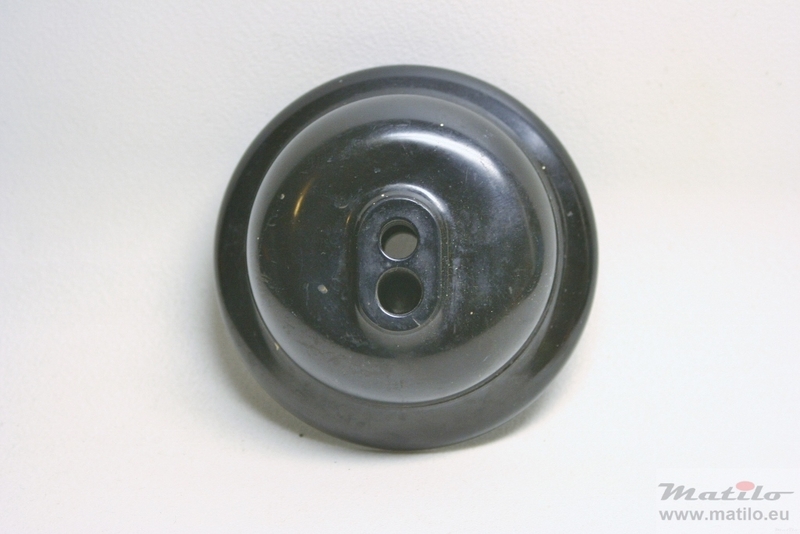 So no modern stuff like fidgety flimsy RJ11 connectors, but proper big stuff with screw terminals and big metal pins, preferably made of bakelite. Components that last for ever, never break and when they do, they can be repaired. So the trick is to find foreign or old style plugs and terminal boxes. To keep things proper and oldskool as much as possible. Otherwise I cannot sleep. Often I get telephones from outside the Netherlands or phones with a kind of plug that is no longer in use. 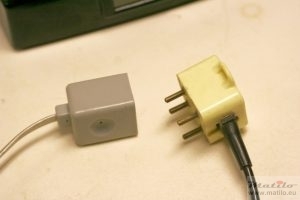 Of course it’s great that the original plug is there. But to connect the phone, I also need a socket, which is sometimes hard to find or expensive to buy. 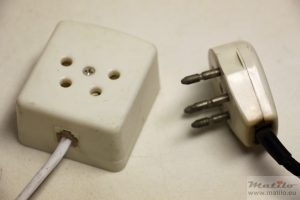 Like this Danish socket I tried to find for 2 weeks, when on vacation there. Visited numerous shops, most of them with a very low touristic appeal. I only found that socket on the very last building supply store before crossing the border into Germany, for a whopping € 13,50. A plug or a terminal box: that is how it should be. Old style, original, the stuff that came with the phone originally. So I can connect a wire to either the corresponding socket or the terminal box in question. And from there to the inevitable RJ11 connector. Well, although I made it sound like something difficult, this is actually the easy bit. Especially now that I have collected quite a few different kinds of sockets, from the Netherlands, present and past and from abroad. I have Swedish, Danish, German, Italian, South African, Norwegian, English, Soviet and even US sockets. Still looking for more though: Hungarian, Czechoslovakian, for example and, strangely enough, Belgian! So, plug > socket > wire > rj11 connector > modem. Good. 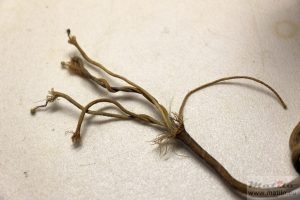 Old phones are disconnected, when no longer in use and cords get damaged so often previous owners cut the cord. When the phone achieves a kind of decorative value and people want to display it, the cord is removed because it looks messy or it is in the way. Frustrating, as some phone lose a lot of their value if the line cord and terminal box are removed. Such as in the case of the Ericsson Skeleton, which decreases in value quite significantly if the wall terminals are removed. 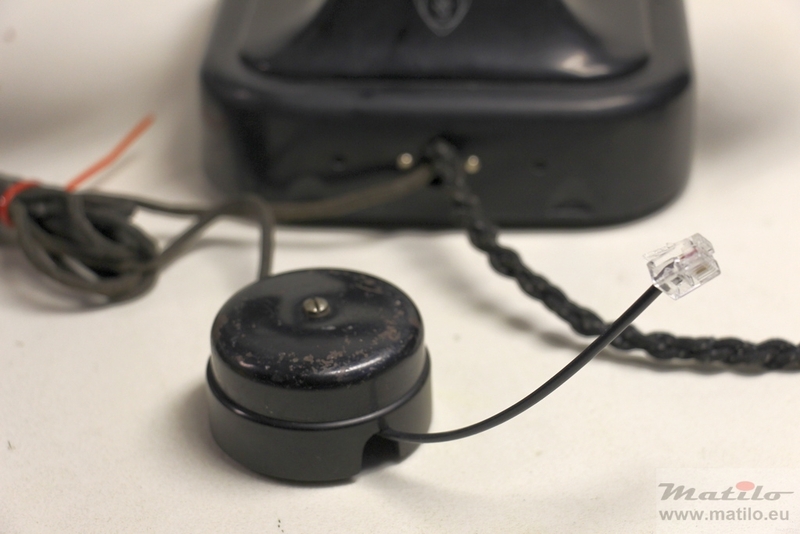 Of course I can make a new cord in the old style or buy a good repro cord, but the phone is no longer original. And in many cases it looks just a little bit different from the original. So, we have an original cord, but the thing that was on the end, either a kind of box or a plug, is missing. Somebody removed it for whatever reason: the box was heavy, the plug needed on another phone, etc. In any case, there is a cord, but nothing on the end. Not only that, often a repair is needed. Spades are missing, eyelets damaged, rubbers and strain reliefs needing attention and of course the same question as with cut cords, what do you put at the end? 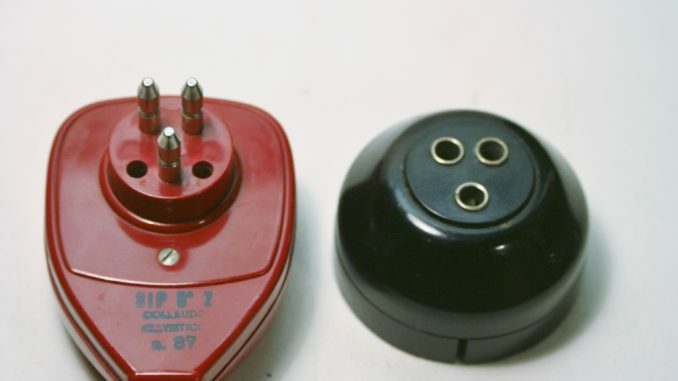 A terminal box, a plug or even an RJ connector. The latter only as a very last resort, of course. So please don’t. I cannot say this often enough. I am really adamant: leave the cords on! Don’t cut them. Leave the plug, terminal box or whatever is at the end in place. Thank you! 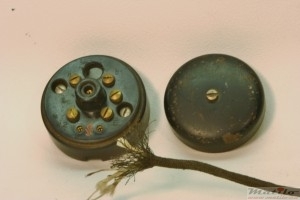 It is still happening today, people mutilating telecommunication heritage by amputating connectivity related pieces. To my great horror, as you may have noticed. For instance, a while ago I sold this beautiful 1930s phone, complete with original 80 year old cord to a private individual. He payed a decent sum for it. After a week or so he called me up and told me his “electrician” friend had removed a piece, because he thought it was a little too long. Now they had trouble reconnecting it. My jaw dropped. I told him that I was not only amazed that his friend had cut an almost century old piece of heritage, but also that I thought it very strange that this professional had trouble connecting 2 wires! Anyway, of course I helped him and he sent the phone back to me by post and I repaired it. And I strongly advised him to get another electrician and friend. DO NOT CUT THE CORDS! EVER! Have you read this article thoroughly? Did you understand the importance of leaving the cords, plugs and terminal boxes on? Really? I solemnly pledge to whatever is holy to me to never ever ever willfully mutilate telephone equipment by savagely removing connecting material. Amen! Cutting the cords is terrible, and even worse for me is switchboards. I have three 555 boards and had to solder connections back on the terminal due to the way they were just cut off. I also found some boards I was going to buy but the whole framework of wired connections had been cut out. Thank you for posting that information! Hi John, thanks very much for your comment. I am not familiar with a 55 board, so I cannot help you there. There are several vintage telephone groups on facebook. Perhaps you can ask there.